Arrival at Kilimanjaro International Airport. You are welcomed by our guide and transfer you to the Outpost Lodge in Arusha. Our tour coordinator will have a short climbing briefing session with you at the lodge and leave you to relax and have dinner. 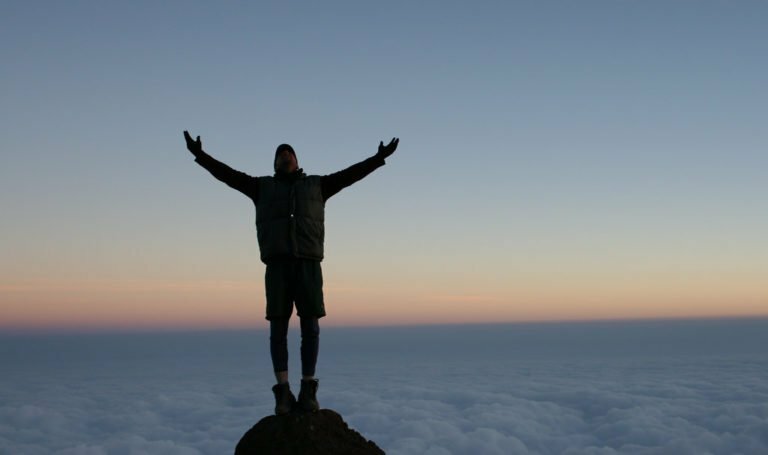 After breakfast, depart Mandara Hut and Kilimanjaro forests to Horombo Hut. Most of the day’s hike will be through Kilimanjaro moorland, a rocky landscape with desert-like plants. Have your picnic lunch at Kambi ya Taabu before continuing to Horombo Hut. If the day is clear, enjoy beautiful views of Mawenzi and Kibo peaks. Arrive at Horombo Hut at around 1500hrs and spend the rest of the afternoon relaxing. This extra day and night at Horombo is ideal for body acclimatization. A hike towards Mawenzi, passing through Zebra Rocks on the way (about 3 hours up and 1.5 hours down), is strongly recommended as it will further assist with acclimatization. After breakfast continue your ascent into the Alpine desert, passes the last water point at 13550 ft/4130m. You will have to fill your water bottles with all the water you will need until your return to Horombo hut in two night’s time (unless you are willing to buy Mineral water at Kibo hut). The summit is now a further 3921ft /1195m up and you will make your final ascent the same night. Go to bed around 1830hrs and try to get as much rest and sleep as possible. Around 2330hrs,you will wake up and after some tea and biscuits you shuffle off into the night, and this is where the going really gets tough. The first section of the trail consists of a rocky path to the Hans Meyer point (17225ft/5250m), also a good resting spot. The path then zigzags up to Gillman’s point (18639ft/5 681m), which is located on the crater rim. This section is very steep with a lot of stone screed, requiring a great physical and mental effort. 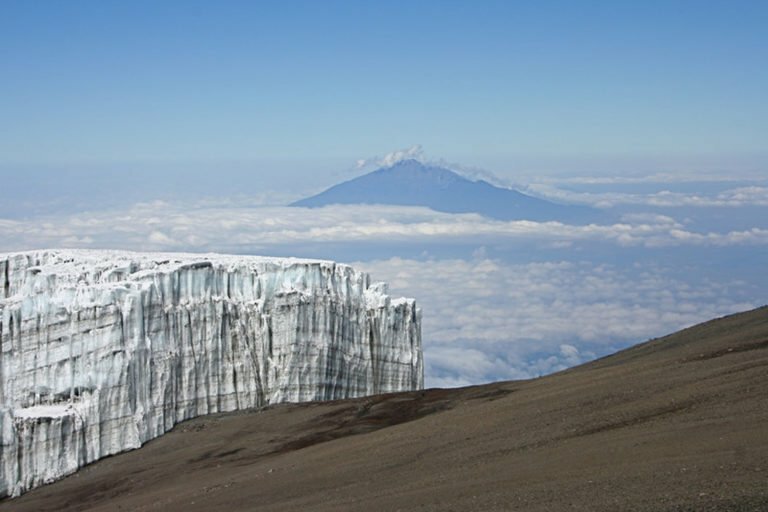 From Gillman’s Point you will normally come across snow all the way up to Uhuru peak (19341ft/5895m), the highest point in Africa. 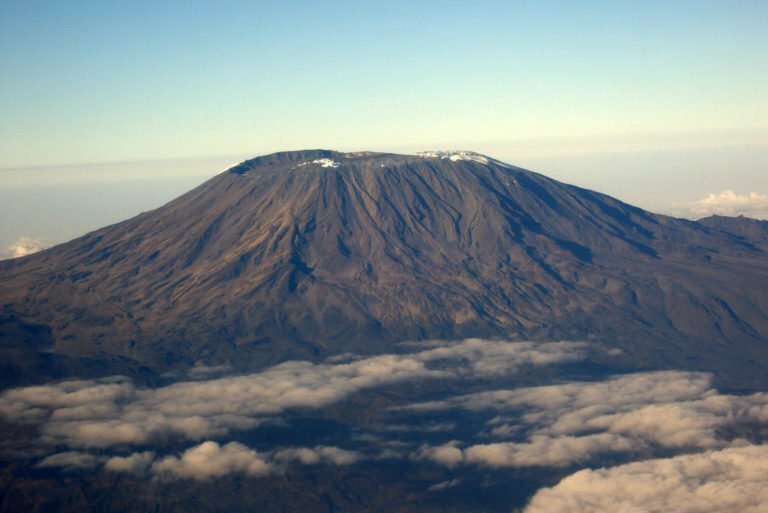 Weather conditions on the summit will determine how long you will be able to spend, taking photographs before the 3 hours descent back to Kibo hut. After a short rest you gather all your gear you left behind for the ascent and head down to Horombo hut (3 hours) for your overnight. Later in the evening you enjoy your last dinner on the mountain and a well-earned sleep, filled with memories and stirring emotions. After breakfast, end the trek with a descent to Marangu Gate. 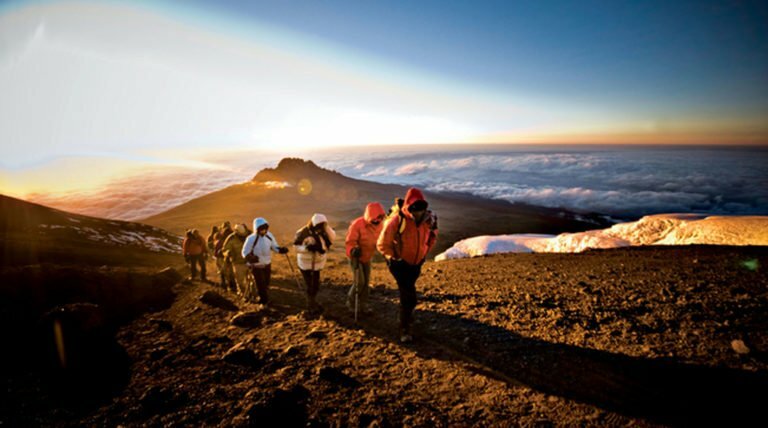 Your last trek on Kilimanjaro is a beautiful one, passing through Kilimanjaro’s cloud forest. Watch your step during the descent, as the trail can be slippery. At Marangu Gate you will sign for departure. This is also where successful climbers receive their summit certificates. 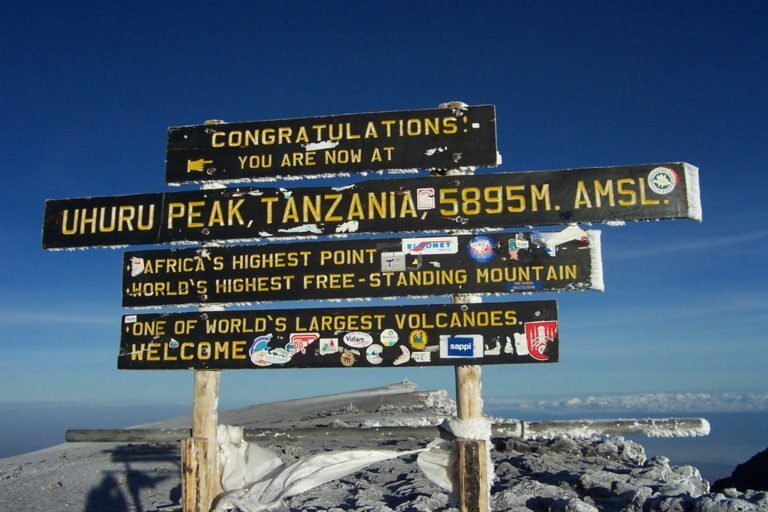 Those climbers who reached Gillman’s Point (18652ft/5685m) are issued with silver certificates and those who reached Uhuru Peak (1 9341ft/5895m), receive gold certificates. Our vehicles will be waiting at Marangu Gate to take you back to Moshi/Arusha. 1. Stay: Stay on the first and last last day of the trek is included in the trek fee. 2. Transport: Transport to and from Airport is Included in the trek fee. No service tax is applicable on transport cost. Roads & Journeys only arranges the vehicle pick up and is not responsible for any issues during transport. 3. Pick-up: Participants are picked up from the Airport. Most participants opt for the Roads & Journeys pick up and we assume the same in your case. In case you do not want the Roads & Journeys pick up you will have to make your own travel arrangements. 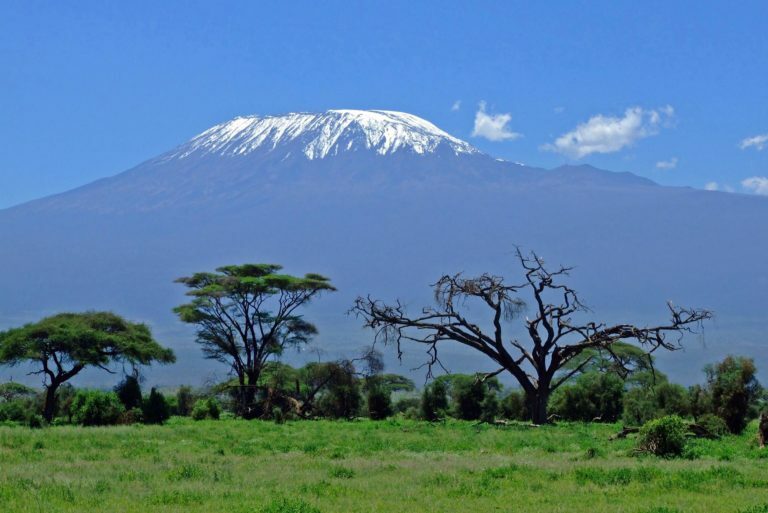 "The roof of Africa is an experience to die for. A must for every avid trekker. Roads and Journeys made this pretty awesome"